I love going shopping, but I hate to stay in line waiting for my turn to pay. It’s not the wait that I hate, so to speak, but all the temptations strategically placed right before the cashier as you wait. If Tiffany goes for the kids coloring or story books I reach for the cooking magazines, actually for everything that has chocolate on the cover. A while back I picked Brownies and Bars from Better Homes and Gardens. I knew it’s going to be love at first sight. Few days later it was love at first taste. Do you think now it’s the time and place to tell you I’ve made these chewy chocolate caramel bars 5 times so far? I see an addiction …. Since I made theses bars so many times, I have tweaked the original recipe each time making it a little better. Right from the start I substituted the store-bought cake mix called in the recipe with a homemade version. Note that the recipe calls for both cold and melted butter. Use the cold one to mix with the flour and the melted butter along with some of the evaporated milk as wet ingredients so the chocolate cookie dough come together. The second and third time I played around with the amount of chocolate chunks and the crumbled topping. I know there’s no such thing as too much chocolate, but in the same time I didn’t want to overpower the caramel layer. The fourth time I have the bright idea of adding more caramels but that didn’t go as I thought it would. The fifth time, learning from my mistakes, I made the most addicted chocolate caramel bars. You would think after making them so many times I had the patience to let the bars cool, but no. I cut half of them while slightly warm. Although I’m a huge lover of chocolate treats while still warm, I have to say this time I prefer the bars the second day when they fully cooled and the caramel layer is set and chewier. It’s just a personal preference. Either way, warm or cold, you should give these chocolate caramel bars a try. You won’t regret it! Buttery chocolate cookie topped with ooey gooey caramel and chocolate chunks, these chewy chocolate caramel bars are to die for! Line a 13X9 baking pan with parchment paper allowing the paper to hang about 1-2 inches over the sides of the pan. Set aside. In a food processor add the flour and cold diced butter. Pulse a few more times until the mixture resembles fine breadcrumbs and all the butter is cut in. You can also use a pastry blender, a fork or rub the butter and flour with your hands. Add the sugar, cocoa, baking powder, baking soda, salt and whisk to combine. In a large mixing bowl add the dry ingredients mix and pour the melted butter on top. Add 1/3 cup of the evaporated milk and, with a spatula or a wooden spoon, stir until well combined. The dough it's going to be similar to a crumbly cookie dough. Spread 2/3 of the dough in the prepared baking pan and set aside. Crumble the remaining dough on a piece of parchment paper and refrigerate until needed. In a small saucepan, place the remaining evaporated milk and the caramels. Stir continuously over low heat until the caramels are melted. Pour over the cookie dough base. Sprinkle the chocolate chunks over the warm caramel layer. Take the reserved cookie dough out of the fridge and sprinkle it over the chocolate chunks. It may seem bubbly and undone but once cooled the caramel and chocolate layers will set. Cool completely in the pan before cutting into bars. Thank you I must try these! These look absolutely divine. Can't wait to try them. These bars look so rich and chewy; my family will love them! Thank you! Roxana, there are simply not words to describe how absolutely amazing these are! 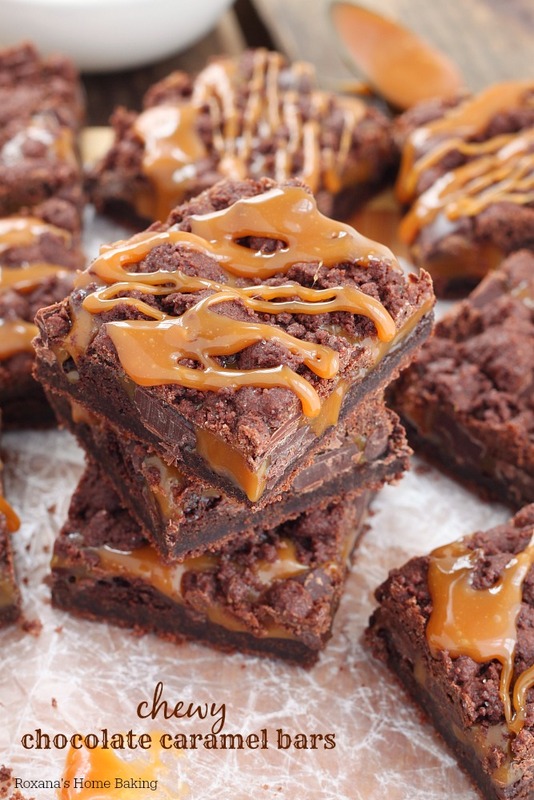 So much chocolate, so much caramel, they are perfection! I can't wait to try them! These look amazing. Chocolate and caramel always hits the spot for me. These photographs sold me on trying to make these at home! What are" 14 oz baking caramels, unwrapped"? Then only caramels I know of are Kraft caramels that are candy. Are these what you are talking about? Yum! I will have to pin these and make them. 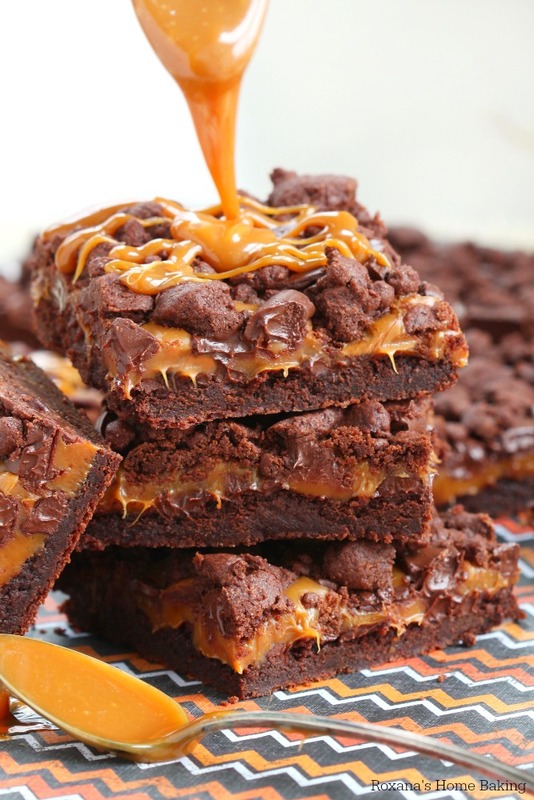 I love chocolate and caramel and these look so decadent and sinful! ha! What divine bars, love that caramel drizzle! 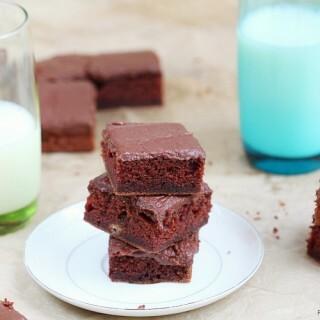 DYING over these brownies, Roxana! 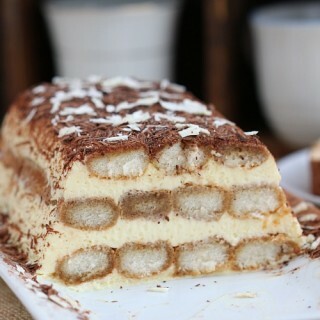 The caramel layer is out of control AWESOME and your pictures are stunning. 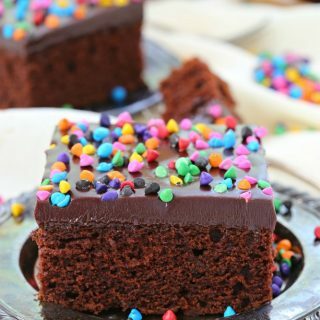 I seriously feel like I could reach into my computer screen and grab some of those chewy chocolaty bites of heaven. Amazing! I love shopping too! 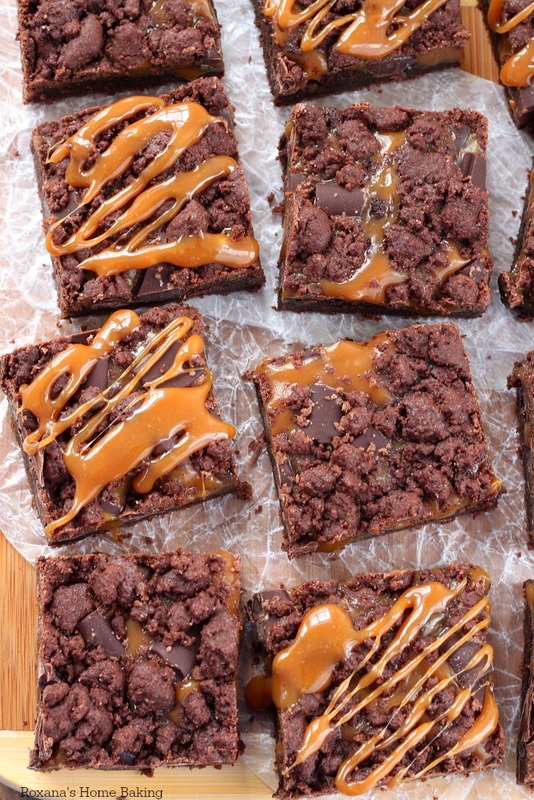 And ooey, gooey, chocolatey, wonderfully caramel-licious bars!!!! OMG...these are seriously decadent! 1 cup of cocoa is a lot..and so are all those chocolate chips! Sigh..I am so eating these in my dreams right now. What yumminess! I love how it soft, but chewy, just like you want in a brownie. I've tried cheescake and pecan and mint brownies before, but I've never really tried it with caramel, so this should be quite tasty! This is love I can always use. These look fabulous! Hello! Can I substitute evaporated milk with condensed milk? Thanks! I must say , I did find it quite frustrating when people fill the comment sections with " looks delicious, gonna try it" etc etc seriously we read the comments NOT to see the obvious but to see what people think AFTER they've tried the recipe ! Just had to rant about this.....lol I actually MADE these today and can honestly say these are yummy. I did find that it would be helpful if you included that 14 oz caramels= 56 caramels and the "sm" tin carnation milk is 2/3 cup and can be divided into 1/3 c x two. These were nice and chewy! Make sure you don't over bake them or the edges get rock hard. Thanks for a great recipe and letting me rant ?